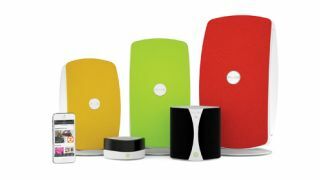 Pure expands Jongo family with T2, T4 and T6 wireless speakers | What Hi-Fi? Pure, manufacturer of wireless systems and radios, is further expanding its Jongo multiroom music system with the addition of the Jongo T2, T4 and T6 wireless speakers. Joining the Jongo S3 and A2, the three new speakers will come in a range of sizes and colours, with bespoke stands and mounts also available to tailor the speakers to any room. Further customisation is available through altering the combination of Jongo speakers to build a single or multiroom set-up. Music playback can be synchronised across multiple speakers, with Bluetooth streaming also available for music stored on mobile devices. Pure has also introduced its new on-demand music streaming service, Pure Connect Violet. Not to be confused with Pure Connect Green (which is free) or Pure Connect Blue (£4.99 a month), Violet is the highest tier available on the service. Priced at £9.99 a month, Violet allows users to take their music from the cloud by downloading playlists to their mobile devices. Offline playback is also possible so users won't have to rely on online connection to enjoy their music. Pure is also upgrading the sound quality of the music on its streaming service. Previously restricted to 128kbps MP3, Pure Connect will be upgraded to 160kbps AAC in Q4 2013 before being boosted to 320kbps in Q1 2014. There are already iOS phone and tablet apps for the service, while an Android app is due to launch any day. An Android tablet app is also in the pipeline. The Jongo T2 has a SRP of £129, the T4 £199 and the T6 at £299. The Jongo T2 and T6 will be on sale imminently, while the T4 is due in September.